New York Law Journal - The Asian American Legal Defense and Education Fund (AALDEF) celebrated its 45th Anniversary on Wednesday, March 27 at Pier Sixty at Chelsea Piers. AALDEF presents Justice in Action awards annually to individuals for their outstanding achievements and contributions to social justice. This year’s Justice in Action Awards were presented to Michael C. Wu, senior vice president, general counsel, and secretary of Carter’s, Inc., and Vanita Gupta, president and chief executive officer of The Leadership Conference on Civil and Human Rights. 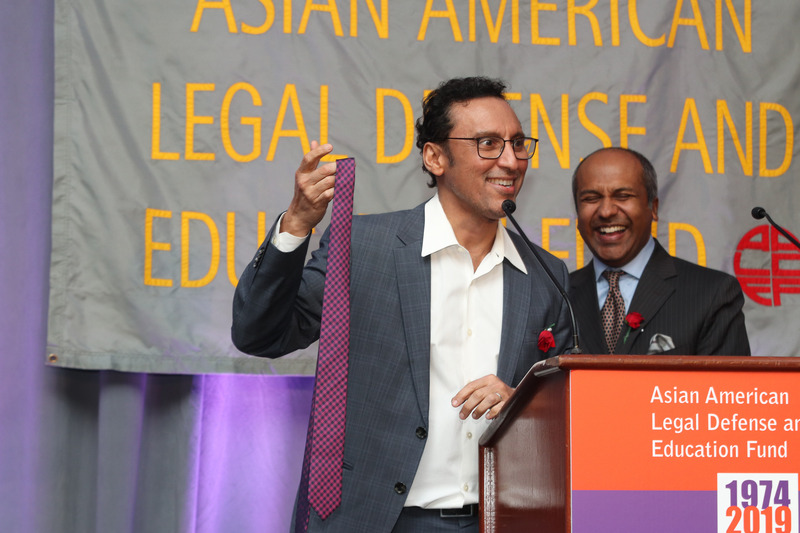 Pictured above, Aasif Mandvi, a writer and comedian who received the 2014 Justice in Action Award, donated his tie for AALDEF’s live auction hosted by social media strategist Sree Sreenivasan.